The UK government is “deeply concerned” by Egypt’s decision to sentence the ousted former President Mohammed Morsi and more than 100 others to death. Tobias Ellwood, Britain's minster for the Middle East and North Africa, said in a statement: “The UK government is deeply concerned by the sentencing to death of former President Morsi and over 100 others yesterday. We note that there are further stages in the legal process, and will continue to follow this case closely. “We look to the Egyptian authorities to apply the rule of law consistently in line with international standards, and to protect the political and legal rights of all Egyptians as the basis for the country’s future stability,” he added. On Saturday, the Cairo Criminal Court sentenced ousted President Mohammed Morsi to death, along with 105 others, including senior Muslim Brotherhood members found guilty of planning mass prison-breaks in 2011. The Grand Mufti now must give his opinion on the court’s decision before the sentence can be carried out. This referral process is a mandatory step in Egypt's court system before a death sentence can be enforced. 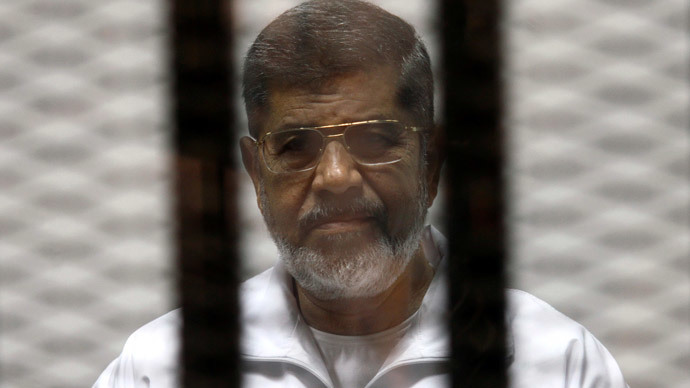 Morsi is already serving a 20-year prison term for ordering the arrest and torture of protesters while he was in power. Morsi, Egypt’s first freely elected president, was ousted by the military in July 2013 after days of mass street protests by Egyptians demanding his resignation. The Muslim Brotherhood was subsequently banned and Egypt’s security forces killed hundreds of Brotherhood supporters and incarcerated thousands. The EU also criticized the court decision, saying it was not consistent with Egypt's obligations under international law. "The court decision to seek the death penalty for former President Mohamed Morsi and more than 100 of his supporters, in connection with a mass jail break in 2011, was taken at the end of a mass trial that was not in line with Egypt's obligations under international law," Federica Mogherini, the High Representative of the EU for Foreign Affairs and Security Policy, said in a statement. "The Egyptian judicial authorities have the responsibility to ensure, in line with international standards, defendants' rights to a fair trial and proper and independent investigations," the statement added. “His trials were undermined even before he set foot in the courtroom. The fact that he was held for months incommunicado without judicial oversight and that he didn’t have a lawyer to represent him during the investigations makes these trials nothing but a charade based on null and void procedures,” said Said Boumedouha, deputy director of Amnesty International’s Middle East and North Africa Program. “The death penalty has become the favorite tool for the Egyptian authorities to purge the political opposition. Most of those sentenced to death by courts since July 2013 have been Morsi supporters. The human rights group urged the Egyptian government to disregard all evidence obtained in the trial and to either release Morsi or retry him in a civilian court with full fair-trial guarantees. Turkey’s President Tayyip Erdoğan also criticized the decision. “The popularly elected president of Egypt, chosen with 52 percent of the vote, has unfortunately been sentenced to death,” Erdoğan said, according to the Anatolian news agency. “The West, sadly, is still turning a blind eye to Sisi’s coup,” he added. Morsi’s successor, the former military chief Abdel Fatah al-Sisi, then secured a landslide victory in the presidential elections in May 2014. However, Egyptian media are now pushing back against al-Sisi, criticizing his undelivered promises in his reform plan and indicating early signs of discontent with the once popular leader. The al-Masriyoon newspaper for example ran an opinion piece with the headline: "Egypt in need of early presidential elections." The author, Gamal Sultan, wrote that Sisi’s government had "moved Egypt further away from stability and put the entire nation on the brink of danger." If Morsi and the other defendants are sentenced to death when the court hands down its final verdict on 2 June, they will be able to appeal their death sentences before Egypt’s highest court, the Court of Cassation. Morsi also faces a separate trial on charges of leaking confidential information to Qatar. On top of that, he is facing another trial with 24 others for insulting the judiciary - the first hearing is scheduled for 23 May, 2015.